A sample of some the chocolates Jennifer Collins will make during Saturday's chocolate making workshops at the L&A County Museums. Photo by Amber Meyer. 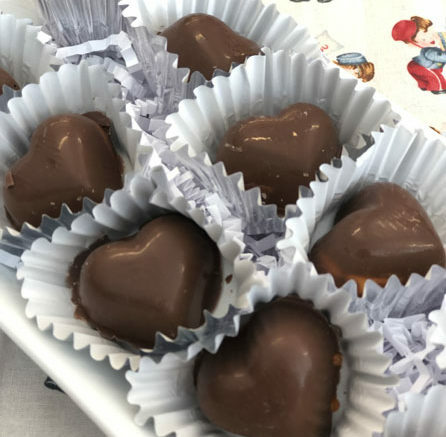 Chocolatier Jennifer Collins will be at the Lennox and Addington Museum and Archives on Saturday to lead a pair of sweet workshops, one for kids and the other for adults. The first will be a Museum Kids’ event starting at 10 a.m. followed by a Heritage Age Workshop at 1:30 p.m. Both will produce the same mouthwatering result-homemade chocolate just in time for Valentine’s Day. That’s if they’re not eaten before then. For both workshops she’ll be demonstrating how to make chocolate and then the guests will have the chance to add the fillings, with options of orange, strawberry and lemon flavours. Collins says the morning kids workshop will be a lot more simple than the Heritage Age Workshop, but notes both are very easy and open to anyone with no chocolate making experience whatsoever. “They’re going to fill their own molds, let it sit, add the cream filling and then let it sit,” said Collins. The final step will involve decorating the box to add an extra creative touch should the chocolatiers wish to give their creations away to their valentine. Admission to the kids event is free. It’s best suited towards children aged four and older. For the Heritage Arts Workshop there is a cost of $35 per person and pre-registration is required by calling 613-354-3027. The two hour workshop is intended for anyone over the age of 14. For more information visit www.CountyMuseum.ca. The museum is located at 97 Thomas Street E in Napanee.